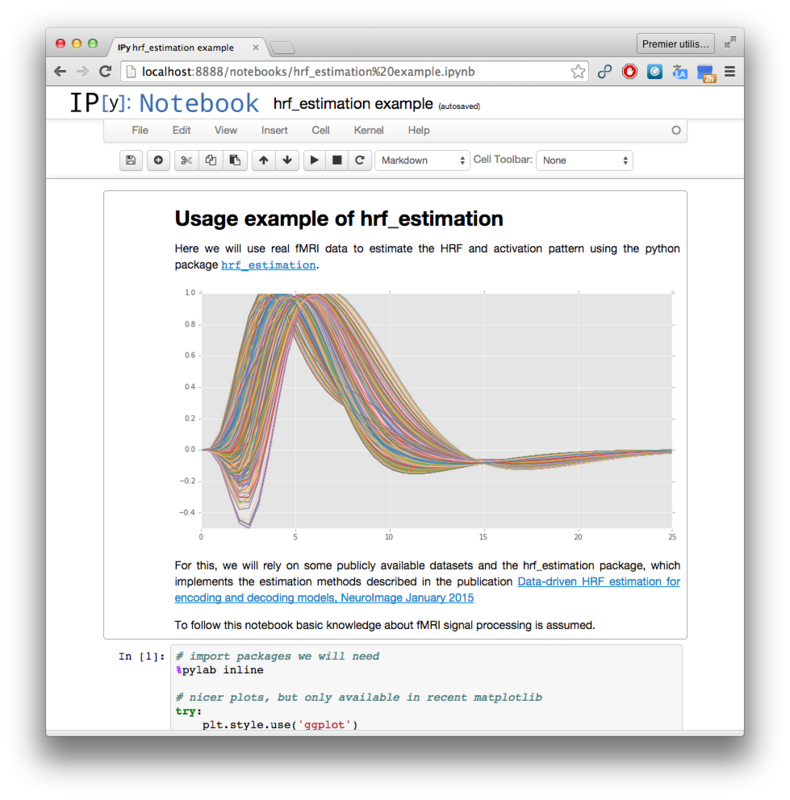 The following ipython notebook shows a complete example of how to use the function hrf_estimation.glm() to estimate the HRF and activation coefficients from a giveb BOLD signal. The main function in the package is called hrf_estimation.glm() and will extract the HRF and activation coefficients from BOLD signal. The function hrf_estimation.glm() is meant to be used whenever the conditions and onsets are available. It will compute internally the design matrix without the possibility to modify it. However, if you have already formed the design matrix and only want to estimate a R1-GLM model from that design matrix and a matrix fo BOLD measurements, then the function hrf_estimation.rank_one() can be used. The package contains other routines for convenience. For example, the module hrf_estimation.hrf contains several models for the HRF (such as the SPM HRF in hrf_estimation.hrf.spmt() and its time derivative hrf_estimation.hrf.dspmt() and its dispersion derivative hrf_estimation.hrf.ddspmt()). The module hrf_estimation.savitzky_golay contains the savgol filter hrf_estimation.savitzky_golay.savgol_filter() for detrending backported from SciPy. Q: What parameters to use when detrending using the savgol filter? A: It depends on the data, we have found that the parameters detailed in the paper Çukur et al. “Attention during natural vision warps semantic representation across the human brain.,” work well in practice. They used a window length of 240 seconds and a cubic order polynomial. © Copyright 2014, Fabian Pedregosa. Created using Sphinx 1.2.3.